Meatless Mondays are so much fun! I try new recipes, I share new recipes, you try new recipes too? :) Have you ever had Mexican Hot Pot? If not, you should, very soon. 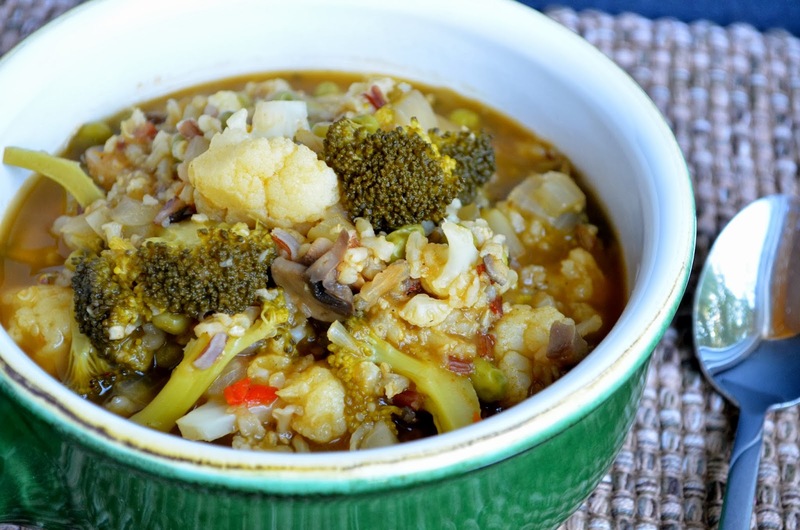 It's a one pot meal made with vegetables, rice, quinoa, and a few other delicious ingredients. It's easy to put together and can be adapted any way that you want to try. Before I get all excited and share the recipe for the Mexican Hot Pot, there are some other fun topics to talk about. First, did you see the itunes cookbook app that just came out on October 1st from Foodie.com? If you haven't yet then you should download it (it's free) because I'm in it! Don't you want to see it now?? You can download it here onto your ipad or iphone. Of course, you can download it to see all of the beautiful pictures and drool-worthy recipes on it! Second, I am so excited about Wednesday's post for the 12 Weeks of Christmas Treats Blog Hop, it's the third week. So excited! I will say that it's a cupcake recipe, but come back on Wednesday to see what makes it so special! It's also easy to make but looks like it took a long time. I love it when recipes are like that. So now that it's October and probably chilly where some of you are, you should consider making this Hot Pot because it's warm, easy, and healthy. I don't usually say recipes are healthy, but this one really is! It's all vegetables, rice, quinoa, and herbs! And, all in one pot! Really, does it get better? 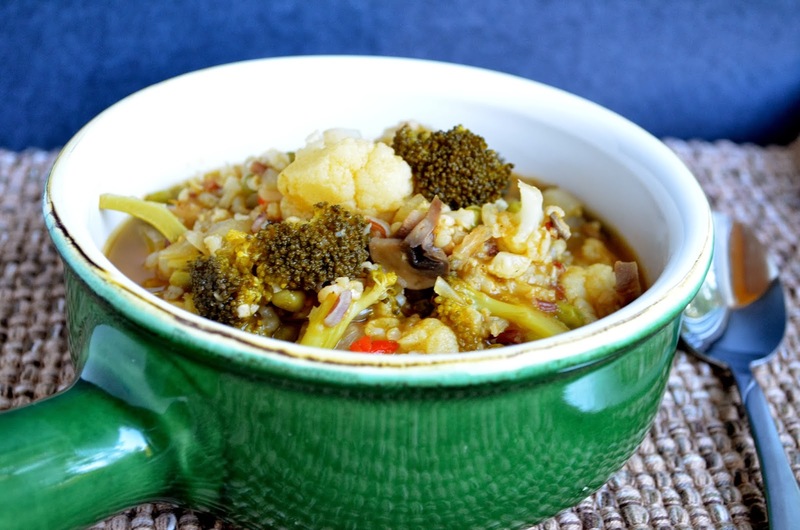 You can also change any vegetables you want, such as all broccoli and no cauliflower, or leave out the quinoa (but it's a whole grain, so why would you :) ). I hope you love it as much as we did! 1. Preheat the oven to 350F. Spray a large oven-proof pot lightly with nonstick spray. Over medium heat, cook the onion for 4-5 minutes or until translucent. Stir in the garlic and chiles, then cook for about 1 minute, stirring frequently. Stir in the mushrooms and cook for 5 minutes or until the mushrooms are cooked down. 2. Stir in the salsa and vegetable stock. 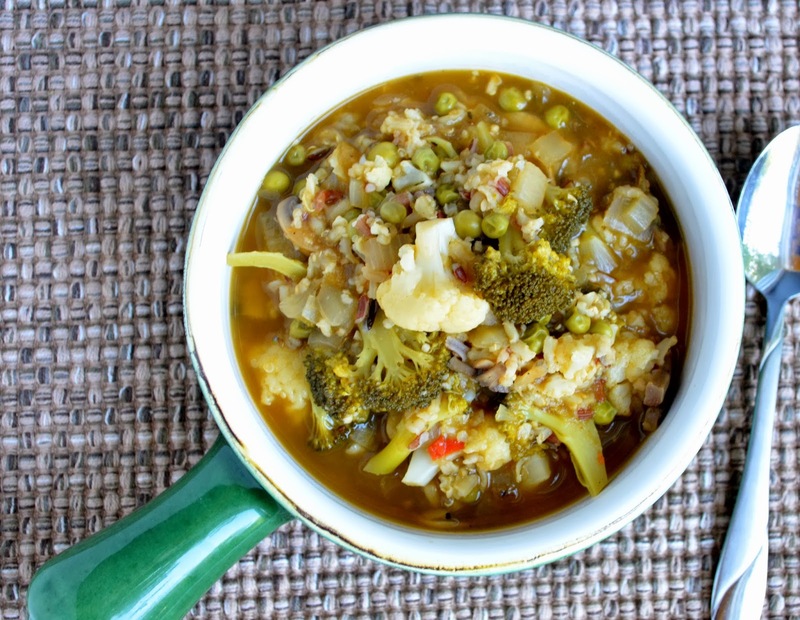 Stir in the green peas, broccoli, cauliflower, and remaining ingredients. Bake for 30-35 minutes or until the vegetables are tender and the rice is cooked. Discard the bay leaves.